Sedgwick County Zoo was established by the volunteer efforts of civic-minded citizens who formed the Sedgwick County Zoological Society in 1963, many years before the Zoo would take shape. When the American and Asian farms opened as the only exhibits in 1971, families were pleased, but they had little idea of the great things that were in store. Now gorillas, penguins and tigers inspire more than 500,000 guests annually. Enjoy our array of exhibits year-round! The Zoo is open 364 days a year. Looking for a fun place to hold a group event, wedding, or your child's birthday party? Choose the wildest location in town: the Sedgwick County Zoo! Party packages are available, as well as rental space at several different locations around the zoo grounds. Call 316-660-WILD for more information or visit our Web site at www.scz.org. The Sedgwick County Zoo is a not-for-profit organization, accredited by the Association of Zoos and Aquariums (AZA). Look for the AZA logo whenever you visit a zoo or aquarium as your assurance that you are supporting a facility dedicated to providing excellent care for animals, a great experience for you and a better future for all living things. With its more than 200 accredited members, AZA is ...a leader in global wildlife conservation and your link to helping animals in their native habitats. For more information, visit www.aza.org. 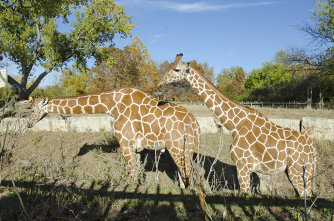 Sedgwick County Zoo is also a member of the World Association of Zoos and Aquariums www.waza.org. Sedgwick County Zoo has been recognized with national and international awards for its support of field conservation programs and successful breeding of rare and endangered species. It's the No. 1 outdoor family tourist attraction in Kansas and is home to over 3,000 animals of more than 400 different species. For more information, visit www.scz.org.